AS THE NEW SCHOOL approaches its 100th anniversary, its graduate students have something to celebrate: a tentative union contract. It didn’t work out according to plan. Despite its founders’ ambitions, the New School currently has a president and a sprawling administrative workforce. David E. Van Zandt, president since 2011, is one of the highest-paid university presidents in the country, making over $1 million a year. And when New School graduate students decided to unionize in 2014, that administration did all it could to prove the founders right in their suspicion of administrators. But after four years of legal challenges and delays, an agreement is on the table. The tentative contract includes significant pay increases, health care benefits, a lump-sum signing bonus for all students, and the waiver of a fee for students working during the semester. The contract also raises the hourly wage of the lowest-paid academic workers, course assistants, from $13 to $16.32, with a 2% annual raise applied to all student-workers after the first-contract bump. “The administration was scared of us. They had no other option,” said Zoe Carey, a fifth-year PhD student and member of the bargaining committee. The agreement was struck late Tuesday night after a seven-hour bargaining session and less than a week before the union was set to go on strike. The announcement adds another success to the growing graduate-student union movement and solidifies New York City as one of the movement’s strongholds. It comes on the heels of Columbia University’s announcement this week that after years of stalling, it is willing to recognize its graduate union. Both the Columbia and New School unions have already gone on strike this year, and both set new strike deadlines for the end of this semester, mere days apart. The two unions petitioned the National Labor Relations Board (NLRB) for recognition on the same day, too, in December of 2014 (Columbia had previously, unsuccessfully, petitioned the Board in 2001). Both units are affiliated with the United Auto Workers (UAW), and members make a point to attend one another’s rallies. The parallel paths of the Columbia and New School unions, and the paired breakthroughs this week, suggest a possible tipping point for the graduate union movement. Workers on dozens of campuses have begun the process of unionizing since the August 2016 NLRB ruling in favor of the Columbia union. This landmark decision reversed the Board’s prior view that private universities had the right to refuse recognition to graduate unions, which was stated in a case involving Brown University. On Tuesday of this week, graduate workers at Brown, too, voted to unionize. At the New School, members of the union’s bargaining committee believe their threat of an end-of-semester strike, which would’ve been the union’s second of this year, is what pushed the administration to move closer to the union’s position. In May of this year, the glacial pace of the bargaining process and, according to union members, the university’s unwillingness to address economic issues, led the union to strike for four days. The administration had initially approached the bargaining process by negotiating over non-economic issues before moving to economic issues, leading to tentative agreements on issues such as job descriptions and workplace harassment even as gaps remained on such basics as wage increases, health care, and childcare. In total, the union had over 60 bargaining sessions since the administration recognized the union in July 2017. The tentative agreement will be voted on by the union’s estimated 850 members early next week. Before this week, union members were not optimistic about the possibility of reaching an agreement without a strike. Unlike many other universities, guaranteed funding, a stipend, or full tuition remission is uncommon at the New School. As a result, for student-workers, supporting the union became a pressing means of enacting the school’s founding principles, which feature prominently in the school’s marketing, within the institution itself. Beyond low pay, workers spoke of horror stories involving student-workers doing professors’ laundry and taxes. 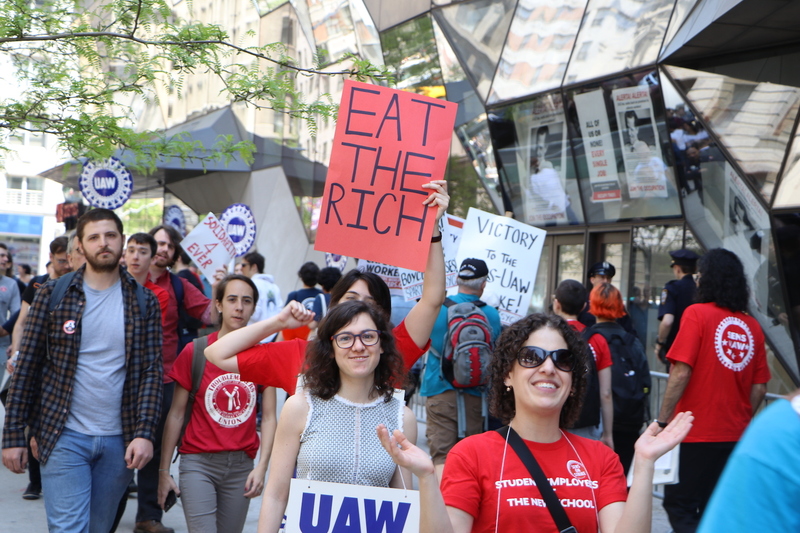 But since the graduate union was formed in 2014, “the administration fought us every step of the way,” Michael Dobson, a fifth-year PhD student and member of the union’s bargaining committee, told Jewish Currents. And union members still have reason to be wary. While the union pushed for childcare supports in the contract, the university instead agreed to “work with the SENS-UAW labor committee on a framework for providing childcare support,” likely leaving the demand to a far-off future. However, bargaining-committee members say they’re proud of getting this far.“We showed other workers on campus that they can and should fight for childcare, and that it’s something we’re all in together,” said Carey. Such is the irony of a sufficiently long historical arc: the New School’s founders articulated an ambitious vision against Columbia University’s administrative power, but 100 years on, their institution acts strikingly similarly to the one they fled—employing a small army of administrators with cushy salaries, filing legal challenges to unionization, and otherwise conforming to the nationwide trend of running their school like a business. It’s no wonder the young scholars at the heart of both schools now lean on one other for support. This week’s news of graduate-union advances suggests a cascade, and the unions certainly have momentum. But a closer look, particularly at the details of the recent Columbia news, should give pause to premature celebrations. In announcing their willingness to begin bargaining, the Columbia administration requested that the union agree to a no-strike clause in exchange for such progress, in addition to nine other preconditions (the union has yet to vote on the proposal). The experience of the New School highlights the risks of such an agreement: their union will put the administration’s proposal to a vote, but its members have made it clear that for now, its strike deadline still applies. “Our strike threat is what brought the university to the table and made them make such a significant proposal,” said Carey. Academic workers are finally scoring victories, but as they know well by now, it’s not over until the contract is signed. Alex Press is an assistant editor at Jacobin and a freelance writer. She is based in New York.